Originally I had no intention of reviewing Tomb Raider on my blog, after all it appeared to have next to nothing to do with horror. 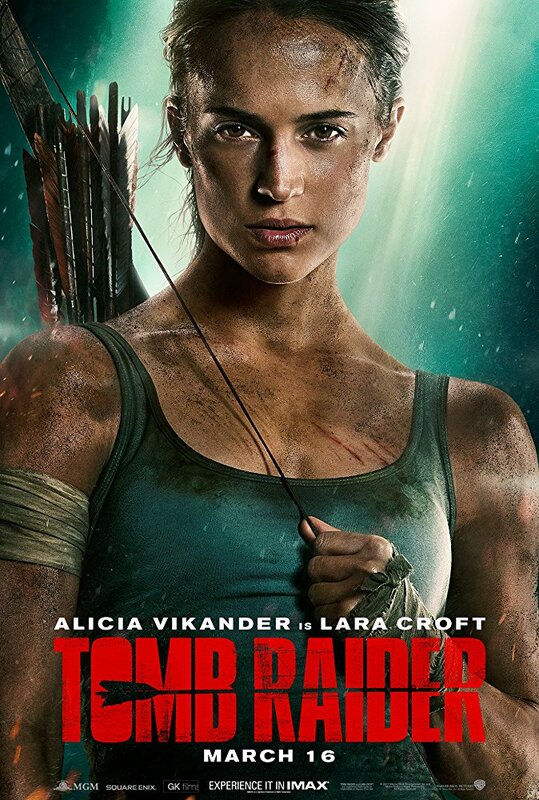 However once I started watching it I realised the plot is heavily based on the 2013 reboot of Tomb Raider; a game that is damn near perfection, and also happens to be very much a horror game. While the movie strips away nearly all elements of horror and the supernatural I felt it was worthy of a review if only as a contrast to the vibe of the video game. So in the video game the island was home to armies of mad men, and Mathias was their leader. Here he is changed to be a member of Trinity which were the antagonists in the 2015 sequel Rise of the Tomb Raider. Immediately that survival horror aspect is lost. In the game it turns out the legends of the Queen were actually pretty accurate, while here this is far more of an adventure with the supernatural element corroded to the point of being feasible in the real world. Loving the game so much I couldn't help but compare this to that and this is in no way anywhere near as good. I did enjoy the elements that were taken from the game. Firstly it was a great idea to base the film on what I believe is the very best Tomb Raider game out there. Secondly it was great to see the screen version of Lara to be the younger, more realistic looking rebooted version, rather than the ridiculous sexed up version of the 90's. Much like in the game she got battle damaged as the film progressed, she is young and inexperienced and so makes plenty of mistakes. There are a few iconic moments that were transported over from the game, and weapons as well, such as the bow and arrow, climbing axe, and duel pistols. There are many elements in the film that just felt either silly or very predictable. In terms of the sense of progression and script this felt quite dumbed down to the lowest common denominator. It all starts with the legend of Himiko as the prologue, but then about twenty minutes later this exact same bit of exposition is relayed nearly word for word by a different character, just in case we had forgotten. Characters have recurring lines that are said for laughs but felt very forced and planned. There was a guy near me in the cinema who kept laughing at these parts, but I really couldn't tell if he was doing that ironically or not. It also took a slight while to get going with a lot taking place in London, including an exciting but ultimately pointless bike race/chase. I get the film needed to show Lara's skills but a later on-foot chase in Hong Kong showed her resourcefulness just as well. Still it is not all dull and unexciting, firstly Vikander is perfect in her role, bringing vulnerability as well as strength of purpose to her role. Goggins is also fantastic as the bad guy, often stealing the scenes he turned up in. Mention must also go to the special effects and set pieces. The whole crashed plane segment may have borrowed a lot from Jurassic Park: The Lost World's bus section (and not been as good) but it was still a fun little scene. The eventual tomb raiding third act was also fun in an Indiana Jones sense. Now admittedly I have never seen Indiana Jones (I do own them on Blu-ray at least) but from the little I have seen of them the whole solving deadly puzzles aspect was here intact. There were also some great make-up effects for when zombie like creatures appear. Finally the whole final battle was a great fight that led up to a cool finish. I don't know if I had the lengthy game in the back of my mind but events here seemed to just barrel forward too quickly. 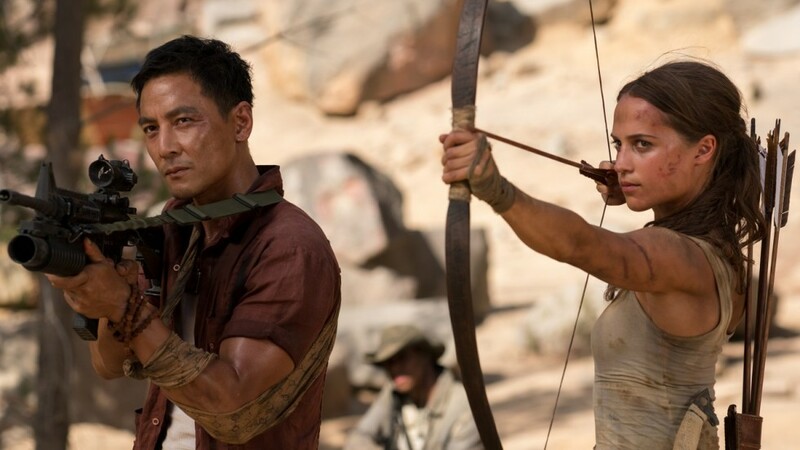 Daniel Wu was relegated to a role that was near enough unneeded, while Mathias and his men allegedly had been stuck on the island for seven years yet I never got the sense that these people really had, they seemed too fresh for that. The whole epilogue completely sets up a sequel that again used elements from the video games so I assume if one does come out it will be based on Rise of the Tomb Raider. Tomb Raider doesn't do anything to offend, and as a brain dead piece of female fronted adventure is watchable at least. However there wasn't a spark of excitement there for me, I didn't regret the near two hour run time, but nor did I leave feeling this was a film I would ever wish to see again. If I want to ever return to the story of Yamatai I will go via the video game. By all means go see this, it certainly isn't a terrible film, it just all felt a little too manufactured and sterile, but at least the protagonist and antagonist are both perfectly cast. As a final note I do admit my love for the game is what held me back from properly enjoying this horror-less re-imagining.